Home Domestic News Could Mata’s Move To United Serve All Involved? Could Mata be set to swap London for Manchester? Could Mata’s Move To United Serve All Involved? Chelsea outcast Juan Mata sensationally today became the biggest story of the transfer window as a range of sources suggested that Manchester United were ready to bid for the creative midfielder. Mata, 25, looks to be surplus to requirements for an extremely competitive Chelsea midfield that favours the undoubted talents of Eden Hazard, Oscar, Willian and Andre Schurrle. The Spanish international has won the club’s Player of the Season award for the past two years running but Jose Mourinho’s return as manager has left Mata rarely appearing for the club, his last action coming on New Year’s Day as the Blues beat Southampton at St. Mary’s. The player’s exclusion from the side has been one of the most talked about stories of the football season, and the focus is set to be highlighted further with the news that United are interested in luring Mata to Old Trafford. It follows Samuel Eto’o inspiring Chelsea to a seemingly comfortable 3-1 victory over United at the weekend, and many argue that this damaging defeat was enough to spell the realistic end of David Moyes’ side trying to defend the title they won last season. 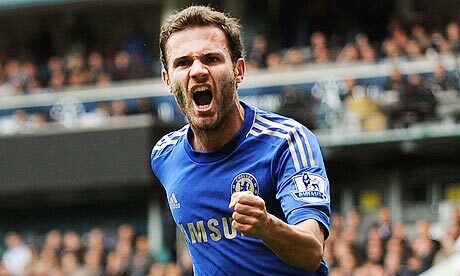 A rebuilding job is required; could Mata be the first piece of the puzzle? Figures of over £35million have been talked about regarding the sale of the player, and it is likely that Mourinho will not take notice of anything lower than this. The Portuguese boss holds all the cards. The club clearly do not need to sell the player for financial reasons, and he is such a talented individual that any Premier League manager would love to call on his qualities including Mourinho himself, who is quoted as saying that he does not want the playmaker to leave. With this in mind Mourinho can name his price, and if United feel that the rate card is too high they will look elsewhere. Mata will of course be aware of the speculation and it is down to the player to consider his options as January goes on. It may take a transfer request from him, following concrete interest from United, to push through a deal which the cynic in me suggests will happen late, late on in the transfer window. If Mata does swap blue for red then it would be a transfer that would suit all concerned. Chelsea would have their money for a player who didn’t want to stay. Mata himself would be inclined to think that a change of scenery and a change of club could do wonders for his international career with the World Cup in Brazil just five months away. United and Moyes would surely be galvanized by the arrival of a world class footballer. As is normally the case in football there is a stumbling block that could prove problematic. The tactics that the former Everton manager Moyes would have to employ in order to let the new arrival fit in are up for huge discussion. Clearly favouring the number 10 role in behind the striker, Mata faces intensive competition from Wayne Rooney, thriving in his withdrawn position until his most recent injury. Would Mata be happy to play wide left or right for United when it was clear that his unhappiness at Stamford Bridge stemmed from him losing his preferred berth to Oscar, thus being asked to play wide? Would Rooney, himself no stranger to speculation surrounding him leaving the club, want to play wide left? Rooney will not replace Robin Van Persie in the main striker’s role once the Dutchman returns from his own injury, and a Mata/Rooney swap deal is entirely out of the question. With all of this to consider Moyes will have extensive work to do if Mata does become the first part of the plan, but the signing might just be enough to shift the Red Devils back into gear and allow them to attempt a springtime assault on the teams above them, even though the Premiership title may already be gone.